Let's take a look at the amazing freebies available from Young Living this month! *If you're not signed up for ER yet, shoot me a message and I'll give you all the details for getting signed up. It's actually super easy! Who doesn't love pumpkin pie? What about spiced cider? YUM! Nutmeg is such an amazing winter spice, and it's also an Adrenal Support Powerhouse! As much as we love the holidays, they can also add stress, weakening our adrenal glands. Here's a tip: place a drop of Nutmeg Vitality under your tongue to give you some added energy for the day too. Another way Nutmeg supports our body is through helping with production of melatonin. So this little oil really packs a one-two punch. Good sleep + a supported immune system!! However you choose to enjoy this spicy oil, make sure you get yours free by ordering 100PV on your November Essential Rewards order! Now let's look at the oils you can get FREE this month with a 190PV Essential Rewards order! Did you know the ENTIRE tree is in this bottle- from needle to root?! And the oil in this bottle comes from trees that sit under the beautiful Northern Lights at our farm in Fort Nelson. Traditionally, Black Spruce trees have been believed to possess the frequency of prosperity. So if you're looking to use the Law of Attraction and increase your Abundance, you want this oil! 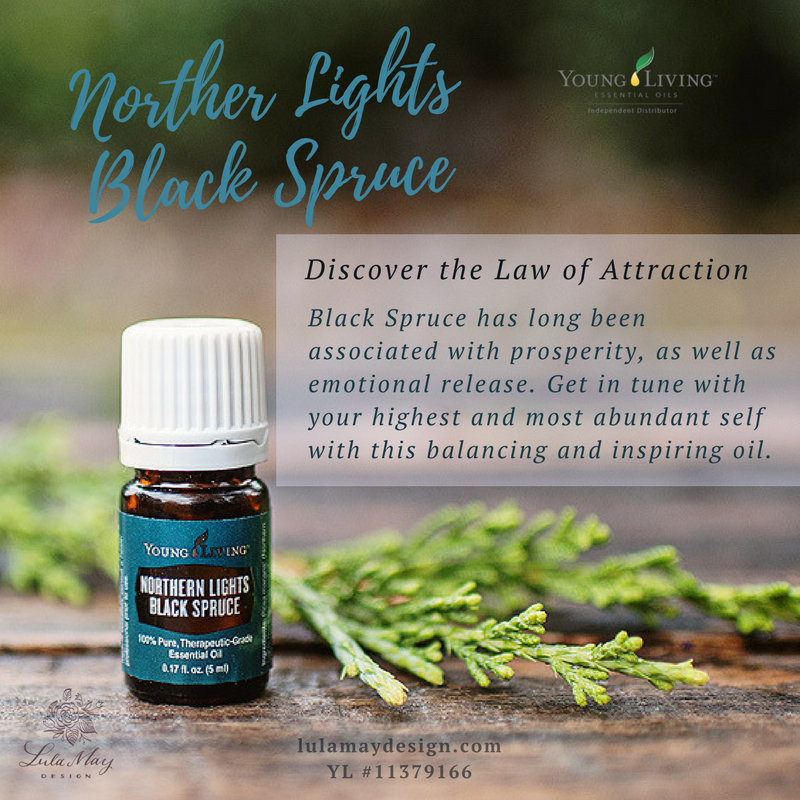 Black Spruce is also one of the most renowned emotional oils, used to release emotional blocks and brings feelings of balance and grounding. This oil has the capacity to make you feel grounded and supported at the same time. It’s aroma is perfect for the season, so switch out those toxic holiday-scented candles and try this safe and natural alternative, perfect for diffusing all winter long! Plus, with your 190PV Essential Rewards order, you will also receive the free bottles of Lemon and Nutmeg Vitality! I love to start my day with a dash of lemon oil in my water or added to my shot of Ningxia Red. This bright little oil helps you feel refreshed and start the day with a positive mindset. It's also high in d-limonene (go Google what that does) so it’s the perfect immune system support for the season! (You will receive the regular bottle with your ER order, but this is also part of the Vitality line of oils safe for ingestion) A drop in honey or warm tea does wonders for the throat & chest this time of year! Need to get things clean? Put lemon oil to work on stains and other hard to clean surfaces. Even guys will see the value in Lemon oil for shining up all their big boy toys! This is probably one of the first oils from your Starter Kit that got all used up! So this month make sure you get a FREE 15mL bottle of Lemon oil when you place a 190PV order on Essential Rewards! Plus you will also receive the free bottles of Northern Lights Black Spruce and Nutmeg! Alright y'all this one has me SUPER excited! I don't know if you remember a couple months ago when Young Living went out of stock and we were ALL freaking our. Why you ask? 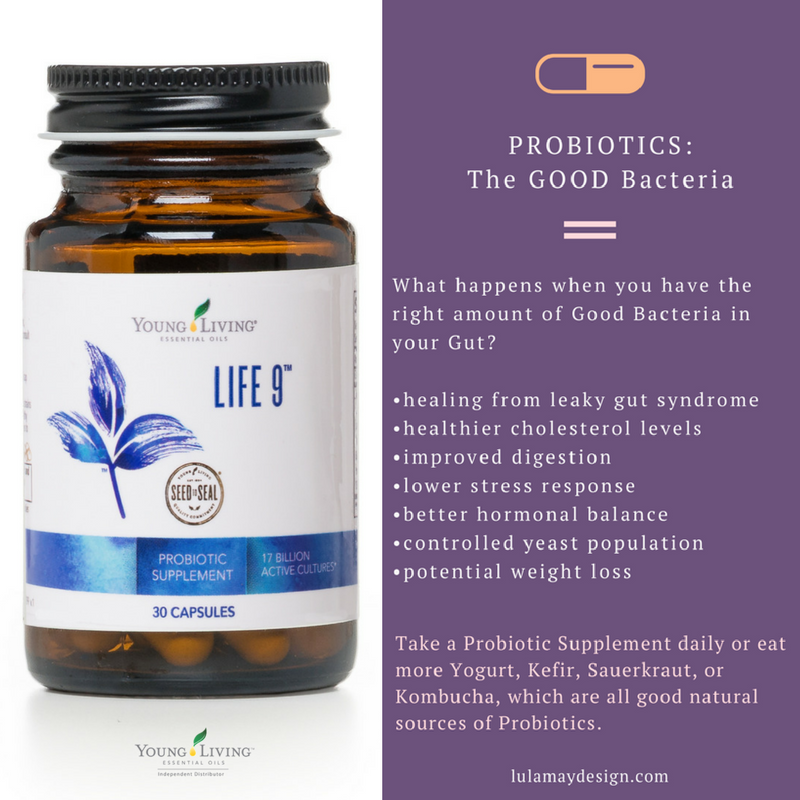 Because probiotics are one of the most important parts of my daily health routine. I've been taking probiotics since 2006, and I've tried almost every brand on the market. Young Living's Life 9 is my favorite, and it's one of this month's freebies if you place a 250PV order during the month of December. If this is an ER order, you will also receive the free bottles of Lemon, Nutmeg, and Northern Lights Black Spruce! True Confession: I've been waiting and hoping this would be one of the FREE oils. Sacred Frankincense is both amazing and expensive. I've had so many other great oils I wanted to try that I decided to just wait for this to be a Promo oil, and here it is!!! Young Living’s Sacred Frank is the first Omani Frankincense to be available to those outside of the Saudi royals and the privileged Oman. So why is this oil so sought after? Well, it is amazing for the skin, it is calming, and wonderful for sleep. It is relaxing and meditative, promoting higher states of spiritual awareness and higher levels of consciousness. And maybe check out some resources like pubmed's website and do a little research to learn a bit more about why this oil is literally “Sacred.” You won't be disappointed with what you discover. 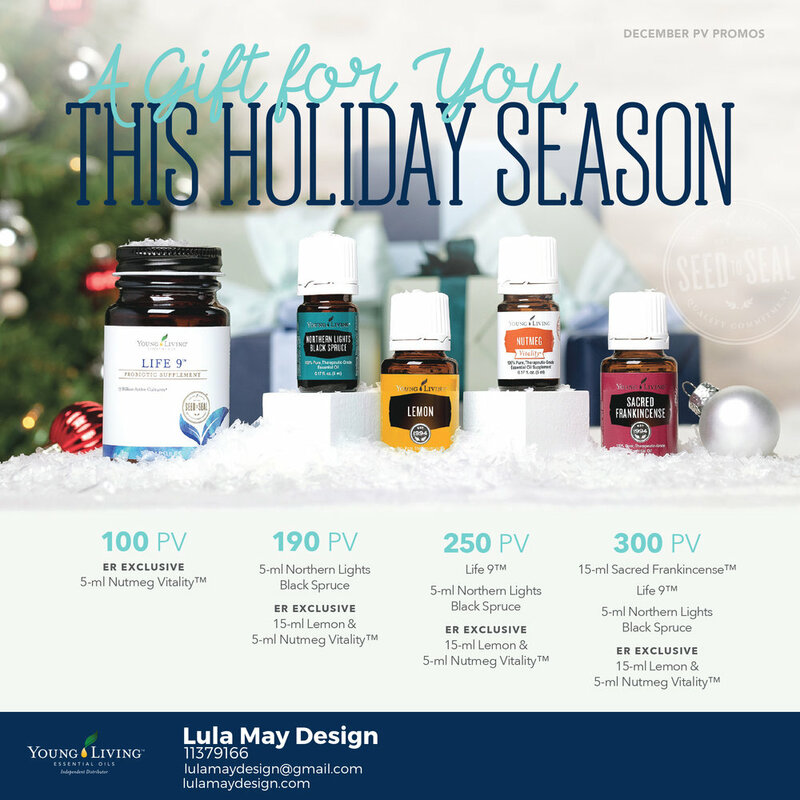 With a 300PV Essential Rewards order you will receive Life 9, Lemon, Nutmeg, and Northern Lights Black Spruce! If you're not signed up for ER yet, shoot me a message and I'll give you all the details for getting signed up. It's actually super easy! You don't need to fill anything out to receive these FREE oils. If you order a certain amount, enroll for Essential Rewards and/or purchase 300PV on Essential Rewards you will automatically get these freebies. Don't worry if you aren't on Essential Rewards yet. I can help you get set up. ALSO, if you enroll for Essential Rewards this month and the order processes for the first time in December, our upline Amy will send you a $10 product credit to use on your next order at the beginning of January. Essential Rewards is an amazing program for ordering monthly. They give us discounted shipping, exclusive freebies, and we earn points on every order to use on free product later. What other questions do you have about these awesome oil or getting signed up for Essential Rewards? Shoot me an email or leave me a comment below.